If this was a movie, there would be a flashback to my freshman year in high school when Alanis Morisette’s “Ironic” was playing on the radio, Warcraft 2: Tides of Darkness was the craze, and the 33.6k modem had just been released. 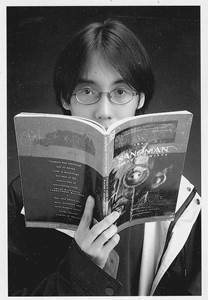 I was this scrawny kid who read Marvel comics and Shannara novels, watched Yu Yu Hakusho and Sailormoon on local TV, kept my SuperFamicom at a time when the first Playstation was surging in popularity, and used my savings to purchase Magic: The Gathering booster packs. All seemed well, except for the fact that I had no friends at school; it was a series of micro–aggressions ranging from being the 7th pick in a six–man group, the constant search for a cafeteria table during lunch time, or simply being the target of insults and bullying from both the smartest and the most aggressive students in class. I had retreated into the school library by then, where I read The Fellowship of the Ring only to discover that the last few pages had been torn out. I would never have imagined that years later, I would be greeting childhood heroes like Ellen Datlow on Twitter, interviewing best–selling authors like Kristin Cashore and R.A. Salvatore via email, forming friendships with talented new writers like Sofia Samatar and Sarah McCarry, or even experiencing the privilege of being asked to contribute to publications like Apex Magazine. It’s not that it was an unconceivable possibility, but it simply didn’t happen to people like me: I didn’t live in the US (let alone New York), I didn’t attend Western conventions (and consequently wouldn’t develop contacts or have access to the whisper network), and no professional venue would publish my writings (be it fiction or nonfiction). The catalyst would be the popularity and development of the Internet and its associated technologies: emails would become more common than mail sent via the post office; blogs would evolve into platforms for sharing ideas, opinions, reviews, and even interviews; videos and podcasts became as accessible as self–publishing; ebooks would be standardized and become palatable to consumers; the battlefield of public relations wasn’t limited to traditional media, but includes the various social media platforms. These changes are evident if you compare this year’s Hugo Awards and World Fantasy Award to that of 10 years ago. Online magazines, blogs, and various podcasts have become nominees. My three nominations for the World Fantasy Award were due to the work that I do blogging more than anything else. If there was reluctance to recognize talented work being done online, that’s not the case now — or at the very least, there’s less resistance. It’s not that the Internet provided something new per se, but it improved two things. The first is the ability to self–publish, and consequently provide marginalized voices a venue. Groups like Medieval POC became relevant, and you had book bloggers from around the world including those from Romania, Singapore, Brazil, and the Philippines — countries Western readers wouldn’t immediately associate with the genre. If there is a resurgence in discussions on diversity and representation in the past few years (including RaceFail and the Women Destroy Science Fiction! Issue of Lightspeed Magazine), part of it can be attributed to the various Internet technologies. It’s not that these discussions weren’t happening before — they have been for years, and that’s what’s frustrating about it — but it was able to unite several like–minded people, and create a transparent, accessible record of events. Suddenly, handwaving historical accuracy and representation is an actual concern because knowledgeable readers will call people out — and in public — compared to the past where it might have been mentioned and ignored. The second improvement is how the Internet has facilitated and expedited communication, whereas it was previously limited by finances and geography. Take for example something as simple as submitting a story for publication in a magazine like F&SF Magazine. You had to print our your story (in most respects an inconsequential task), go to the post office (a time tax especially if writing is not your main profession), purchase the appropriate stamps and package (let’s just say it’s more expensive to mail a fiction submission if you’re living in the Philippines compared to one living in the US), pray that the package is not lost somewhere during the process, and then wait (due to the travel time in addition to the actual task of reading a print slush pile). It’s not really a surprise that the first Filipino short fiction to be included in The Year’s Best Fantasy and Horror originated from Strange Horizons, an online magazine, as this process was streamlined to writing fiction, emailing fiction, then waiting for acceptance or rejection. In fact, if we want to talk about processes, the smarter online magazines are able to give a faster turn–around time due to leveraging online technologies, whether it’s having an online submission form on their website to being able to disseminate submissions to multiple slush readers. And this isn’t limited to the writer’s end. As a consumer, I wasn’t able to read The Big Three magazines like F&SF, Asimov’s, and Analog because of distribution limitations; but websites like Clarkesworld, Lightspeed Magazine, Apex Magazine, and Strange Horizons was always accessible and something I could refer or link to. And for those who do a lot of commuting, some of those magazines also have podcasts (in addition to the websites that specialize in podcasts), so that is another method for engaging with the content. Print will always be limited by distribution networks (and this usually means people like myself will often get the shorter end of the stick), while online has solutions to many of the shortcomings of print. From a macroscopic level, the key processes haven’t changed: publishing is still run as a business, writers still write, readers consume what’s out there, and fans are somewhere in between (whether it’s being a patron of their favorite author, creating fanzines, or contributing to discussions at conventions and forums). Perhaps the balance of power and influence has changed: authors now have more options rather than simply relying on their publisher; the transition from fan to content creator is more permeable (and vice–versa); and sometimes, readers are able to influence more directly what kind of content they want to see from authors, such as the case of peer–funded projects (e.g. Kickstarter, Indiegogo) and services like Patreon. But what is definite are the personal experiences, and I can only speak with authority regarding my own. I started with blogging, whether it’s starting my own or participating in the comments section of others; I think the latter is important, and will depend on the venue. For example, my friendships with Jeffrey Ford and Ellen Datlow started with commenting on their Livejournal, offering to help them. This could easily have occurred meeting them in person at a convention — not a possibility for me since I live in the Philippines—or perhaps by corresponding with them via mail — again, not a possibility since their mailing address wasn’t public. That’s not to say this is applicable to every author: Neil Gaiman for example is extremely popular, so it’s not likely that every comment on his blog would receive a direct reply. I was once able to mail George R. R. Martin some books from the Philippines after a brief inquiry via email, but with the current popularity of Game of Thrones, I’m not sure if that’s possible these days (although I haven’t tried). That was back in 2006, and for some authors, the platforms they use change. Jeffrey Ford for example has shifted between different social media platforms, trying each one out and discarding them when he doesn’t find them as engaging. Ellen Datlow, on the other hand, seems to be everywhere, and maintains active accounts at Twitter, Facebook, Flickr, etc. Each author will have a different policy with social media (i.e. some might favor Twitter and eschew Facebook, while for others it’s the reverse), but it’s something that needs to be considered. When I initially started reviewing books, I reviewed books I bought. Eventually, publishers and authors would offer to send me books to review. Since I’m from the Philippines, I can understand the plight of publishers offering to mail me books: it’s expensive to mail them to me, it takes weeks if not months before they arrive, and the book getting lost in the mail is always a possibility considering our postal system here. So I was one of the book bloggers who requested an electronic copy if possible to expedite the process (emailing me a copy today is vastly different from receiving the book in the mail two months from now). It’s an interesting evolution to watch the eBook industry progress, from publishers sending PDFs to eventually industry–standard formats like EPUB and MOBI, to even using services that specialize in advanced reader copies like NetGalley, which utilizes Digital Rights Management (DRM). The last part is a stark contrast to authors like Kelly Link or Cory Doctorow, who have books and stories licensed under the Creative Commons License, making their work accessible and taking an approach that many large publishers are afraid of doing (i.e. giving away your product for free). This model of sending reviewers electronic copies is also apt for small publishers and specialty publishers like PS Publishing: their business is focused on selling premium print copies with a print run of a few hundred, so providing eBooks to reviewers doesn’t really interfere with that model. This benefit would extend to providing copies for judges in awards, and this was the genesis of the Hugo Voters Packet, a service that is currently expected (or even taken for granted). Another field I would eventually specialize in are interviews, specifically those conducted via email. Email interviews are distinctly different from in–person interviews, whether in the methodology or the way it’s received by the reader. For example, one method of conducting email interviews is sending the interviewee all the questions at once (and involves some foresight on the side of the interviewer). Another method would be to send it one question at a time, but this can be a huge time sink for both parties. Perhaps one advantage for interviewees is that they can look over their answers and edit them, something that would not be possible with a spontaneous, live interview. Readers, on the other hand, I suspect, like to receive lengthy, focused answers, so quips or digressions aren’t optimal for print interviews, whereas those same quips would make a great sound bite for a video or audio interview. My choice of doing interviews via email was done because of my specific circumstance. Aside from the geography aspect, my Internet at the time was neither stable nor fast, so doing a podcast was not a possibility. There is also the time zone difference to consider, which might be a factor in scheduling. And speaking of podcasts, audio interviews — and sometimes even video interviews — have also become popular (perhaps even more popular than print interviews), so that was another accessible way of engaging with readers without having a huge network or radio station being interested in an author’s work. Currently, I’m still the same reader that I was when I was in high school, but I don’t feel as alone as much. If I wanted to talk to someone about genre, it’s sometimes as simple as tweeting or posting a Facebook status update (although there is no guarantee of receiving a reply). But that’s the perspective of someone who’s managed to acquire online social capital, and that’s not necessarily something every fan will have access to. Still, considering the previous possibilities which might have been limited to attending a convention in person or a lucky fan mail, I prefer this method, as there’s always an opportunity. My perspective in a lot my interactions has always been how can I help you, and the Internet has helped me transmit that message across. Charles Tan is the editor of Lauriat: A Filipino–Chinese Speculative Fiction Anthology and the Philippine Speculative Fiction Sampler. His fiction has appeared in publications such as The Digest of Philippine Genre Stories, Philippine Speculative Fiction, and the anthology The Dragon and the Stars (ed. by Derwin Mak and Eric Choi). He has contributed nonfiction to websites such as The Shirley Jackson Awards, Fantasy Magazine, The World SF Blog, and SF Signal. You can visit his blog, Bibliophile Stalker. Great article, Charles, and a topic I can relate to. I’ve lived in Europe for the past 23 years and many of the issues you mention apply to all of us outside the US and the UK, although, perhaps to a lesser degree than someone in Asia. Anyway, I’m glad that there is now a way for us to participate more fully and I look forward to more people in the wider world getting involved in the Community!